Red Flag Warning for critical fire weather Wed night to Friday morning. 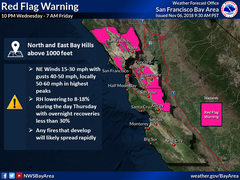 The National Weather Service in San Francisco has issued a Red Flag Warning, which is in effect from 10 PM Wednesday to 7 AM PST Friday. creating critical fire weather conditions on top of very dry fuels. 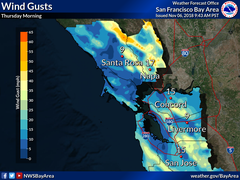 * AFFECTED AREA...North Bay Mountains and East Bay Hills above 1000 feet. * WIND...Northeast winds 15 to 30 mph with gusts 40-50 mph,locally up to 50-60 mph in the highest peaks. * HIGHEST THREAT...The hills of eastern Napa County as well as around Mt Saint Helena, Mt Tamalpais, Atlas Peak, Mt Diablo, Mt Hamilton. A Red Flag Warning means that critical fire weather conditions are either occurring now...or will shortly. 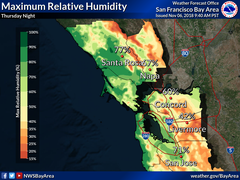 A combination of strong winds...low relative humidity...and warm temperatures can contribute to extreme fire behavior. Do not mow dry grass. Do not use mechanized or powered equipment in or near dry vegetation. Refrain from using outdoor fire pits. Report any sign of smoke or fire immediately by calling 911.